This video, produced by the Migration Agents Registration Authority (MARA), explains why and how the Migration Advice profession is regulated. It's less than 4 minutes and definitely worth viewing! Registered Migration Agents (RMAs) are required by law to obey the Code of Conduct administered by the Migration Agents Registration Authority (MARA). 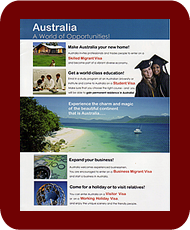 Anyone who is serious about migrating to Australia is strongly advised to view the MARA Code of Conduct, as it provides complete protection against fraud and abuse - as long as you have a Registered Migration Agent working for you! The MARA Code of ConductClick to view the Code of Conduct document on the MARA web site. It will open in a new tab/window. the complaint procedures available to you if you are not satisfied with the work of your agent. Registered migration agents are required to provide the Consumer Guide (in English) to clients after agreeing to do work for them, but before commencing that work; the Guide is available in a wide range of languages from the MARA web site. Consumer GuideClick to view the Consumer Guide Document on the MARA web site. It will open in a new tab/window.